Streetscape enhancements, along with the public and private signs, are the major design area where the image and theme of the community is reflected in the materials chosen. The following materials are recommended for the improvements in the downtown area. Sidewalk Pavements. The material selected for the pedestrian walks in the core area is pressed concrete with a red brick pattern for the majority of the surface. The pattern may be varied to provide interest, with the details for the pattern type developed during the design phase of the project. This walk treatment should be used along Main Street on both sides, on the primary walks extending to the regional jail parking area and the Courthouse, and between the parking and the rear business entrances along Houston Street. 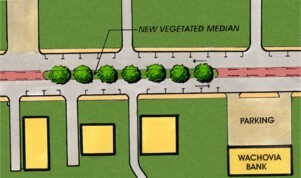 It should also be used for the pedestrian connections between Main Street and Houston Street. Some areas may be treated with a slate appearance to coordinate with historic pavement areas in front of the County Courthouse. Sidewalks in the approach area should be scored concrete. Crosswalks and Center Turn Lane. Pedestrian crosswalks and the center turn lane of the approach area should be constructed of pressed, colored asphalt with a brick pattern similar to the core area sidewalks. The pedestrian crosswalks should be provided with a reflective light edger easily noticed by the vehicle drivers. The "Streetprint" system provides effective, durable materials for this construction. The dedicated left turn lanes should be consistent in material and marking with the travel lanes. Halifax County Courthouse Wall. The County Courthouse grounds are currently enclosed by a brick wall that serves as both a visual and circulation barrier, reducing the positive effect of the courthouse green and the historic building itself on the adjacent street and the downtown area. The plan recommends that this wall be removed and replaced as necessary with a low retaining wall consistent with the earlier historic treatment of the site. The wall should be constructed to match the material and style of the new Memorial Plaza wall on the north side of Mountain Road. Street Furniture. Benches, trash receptacles, bike racks and other street furniture should be provided to encourage informal use of the public street and plaza areas. Rather than selecting one type of furniture, the plan recommends that different compatible benches be used in the various downtown areas in order to provide interest and variety. Trees should be low maintenance, with minimum leaf litter, and tolerant of road salt as well as low moisture, high temperature environments. Trees adjacent to pedestrian walks should be specified to allow pruning to a minimum branch height of seven feet at the time of planting. Trees in roadway medians and in chokers adjacent to the travel lane should be selected for a narrow crown to avoid interference with truck traffic. The branches should be pruned high enough at the time of planting to allow good visibility for the drivers of semi trailer trucks. Trees should be selected for consistency in specific areas but for variety along the entire streetscape. They should provide seasonal interest, including fall color and spring or summer flowering. Evergreen trees should be used in selected areas.